Hot stuff for hot summers! 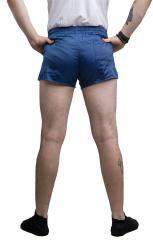 These are German Bundeswehr issue blue sport shorts, used but clean. Although these are not as atrocious as the East German equivalents, they still have plenty of Günthersport spirit. The look is very 80's: short and shiny. 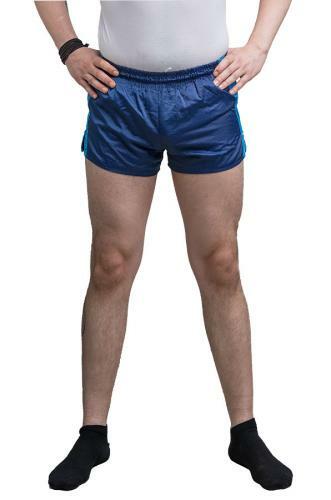 The shorts are made of two layers. The inner is a soft mix of cotton and viscose, while the outer layer is made of polyester and viscose. The waist is adjustable with a string. A small pocket on the backside is enough for all the essentials you might need while playing with the boys. 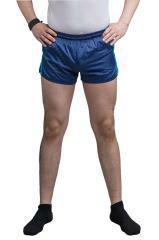 The shorts are used, but washed clean. I was at your shop this weekend and bought a pair of these bad boys, mostly as a joke.. But i never want to take them off again, they are super comfy! So now im buying 3 pairs more. I bought these as a joke as well ... and I wear them all the time. Having a 34”-35” waist, I generally wear a US medium (or sometimes a large), but with these I found that a large (6) was *just* big enough for me. I then ordered the x-large (7) and the fit is perfect. So when in doubt, upsize a good bit. Aside from the sizing issue, these are awesome. I bought these on the off-chance, since they're cheap and looked comfortable. First - The fit. I bought a medium, I've got about a ~26" waist and ~38" hip and ~24" thighs - So I'm very used to shorts not fitting me very well. These manage to not only fit comfortably, but flatteringly - They ride up a little bit at the back, they're not too loose or tight over the thighs, and the drawstring waist can be adjusted to fit. Most amazing though is the comfort - The cotton lining is a thick, soft, jersey with only a horizontal seam in the gusset, so there's no annoying chafing from the vertical seam. It will soak up and wick away plenty of sweat without it showing on the outside, and then there's a nice air gap between the lining and the outside, so the sweat dries fast. Thus, they're comfortable and can be warm, without being stifling or binding. Second - The quality; These are rock-solid, nice thick fabrics, plenty of big seam allowances and well-finished edges. these look like if you need to wash them quickly, you could lift the lining up and hand-wash it in the sink or under a tap, without getting the outside fabric wet (Which would take longer to dry). The outside fabric is the semi-waterproof sort that mud and things brush off very nicely when dry. Overall, they're incredibly comfortable and if I could get away with wearing them all the time, I would. Rather glad that I've got two pairs, so that I can!